Using the F12 tools, you can debug, test, and speed up your webpages. Whether you need to fine tune your CSS layout or find a memory leak, you'll find tools to help here. "The menu bar and the toolbar are missing in Internet Explorer." Question: I cannot turn off the automatic script debugger under explorer options. 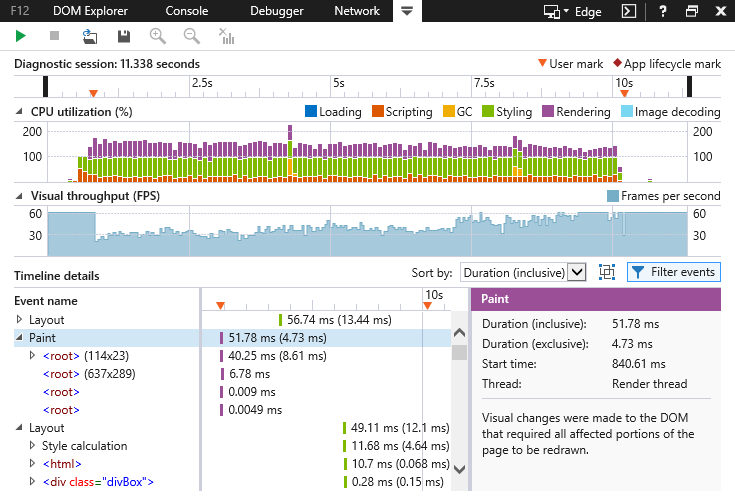 We rebuilt the F12 tools from the ground up in IE11. They have a brand new UI and new functionality to make your developing and debugging faster and easier. And we're going to be rolling out more improvements in updates. Press the F12 key on your keyboard to open the tools. If your keyboard doesn't have function keys, you can use the Tools menu. There are eight distinct tools, each with their own tab in the F12 tools interface. Here you'll find an image of each tool, a quick summary of what it does and what's new, and a couple of typical development or debugging tasks the tool makes easier. The The DOM Explorer tool shows the structure of your webpage as it's being rendered in the browser and makes it possible to edit your HTML and styles in a live page. You can do this without having to edit and reload your sources, so you can quickly solve display issues or experiment with new ideas. IntelliSense autocompletion suggestions when editing HTML attributes and CSS properties. Drag DOM nodes to rearrange them. Determining why an element is not displaying at the right place or right size. Figuring out which CSS styles and media queries are being applied to an element. Testing a series of different colors for an element to see which looks best. The pseudo-class toggle shows your styles in hover and visited modes by simply checking a box. The Trace and Computed panes are combined, making room for a new Changes pane that tracks the changes you've made to styles via the DOM Explorer. The Computed pane features "change bars"; visual indicators that a style has been changed. The new Color Picker tool makes it easy to select colors via an eyedropper, sliders, or a selection of presets. Learn more about the DOM Explorer tool. The Console tool provides a way to interact with your running code, sending info in with the Console's command line and getting info out using the Console Debugging API. The Console tool is considered to be so useful by developers, we've made it easier to get to. You can now open it at the bottom of any other tool using the Console button in the upper-right of the UI, next to the Help button or CTRL + `. Open the Console at the bottom of any other tool with the Console button or CTRL + `. New Console Debugging API methods for timing, counting, grouping, and more. Viewing system error messages, exception warnings, and debug output. Timing code execution down to the statement with new timing methods. Changing the value of a variable in running code without reloading. Target drop-down menu applies console commands to specific iFrames in your documents. The Clear on navigate toggle gives you a control for preserving or deleting console messages after navigating to a new page. An Always record developer console messages option means you no longer have to open the console to start capturing the output to it. 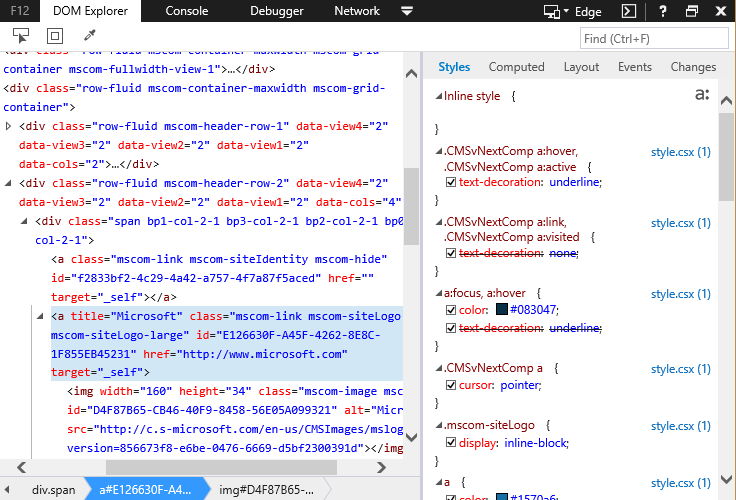 The console.timeStamp() command shows the number of milliseconds the current browser tab has been open, or it can be used with a UI Responsiveness profiling session to create time-stamps on the session timeline. Stale message indication greys out the icons on console messages from previous pages when Clear on navigate is turned off, making it easier to spot just the current messages. IntelliSense autocompletion is refined, removing indexer properties that cluttered the suggestions. CTRL + L now clears the console. Learn more about the Console tool. 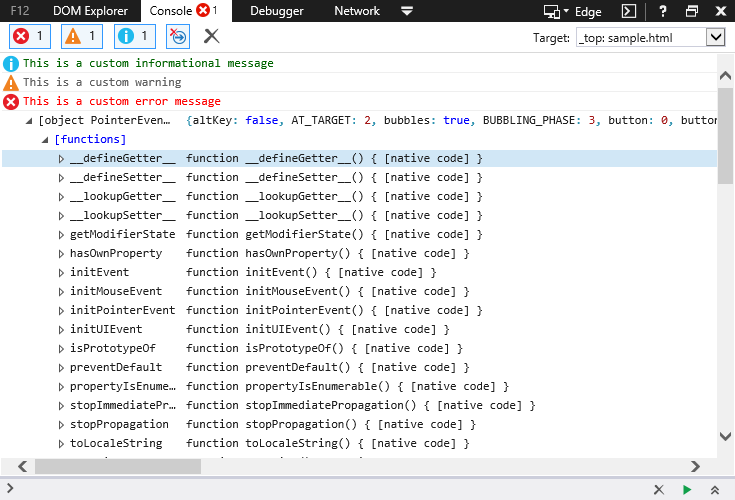 You use the Debugger tool to examine what your code is doing, when it's doing it, and how it's doing it. Pause code in mid-execution, step through it line-by-line, and watch the state of variables and objects at each step. Seeing what led to a function call using the Call stack. Source map support helps you trace errors in compressed code back to your more readable source files. Just My Code helps you exclude 3rd party libraries from debugging tasks, so you don't find yourself stepping through someone else's unhandled exceptions while trying to debug your code. Breakpoints and open files are preserved between sessions, so you can leave and come back without losing all that information. Choose source map lets you specify a source map for a file when it hasn't been specified internally. Breakpoints and tracepoints can be attached to events. Asynchronous call stacks let you see related call stacks when broken in response handlers to more easily debug asynchronous calls. 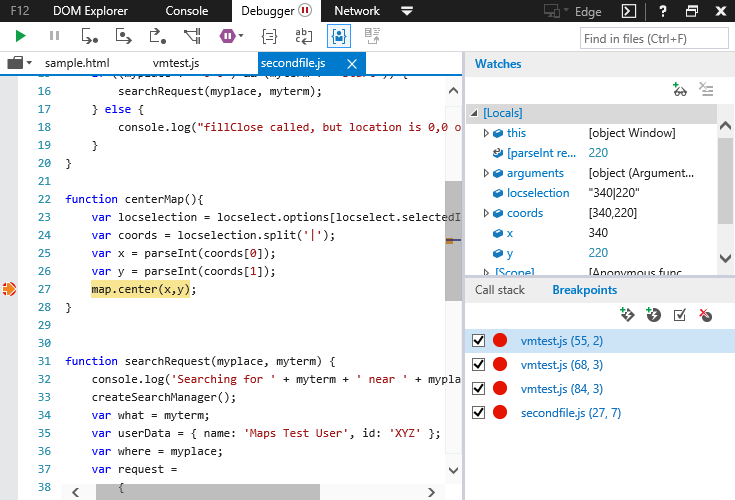 Learn more about the Debugger tool. The Network tool gives you the fine details of any network requests involved in the loading and operation of your webpages. Improved capture of compression info. Viewing the amount of bandwidth your page consumes across resources. Debugging AJAX requests by viewing request and response headers and bodies. 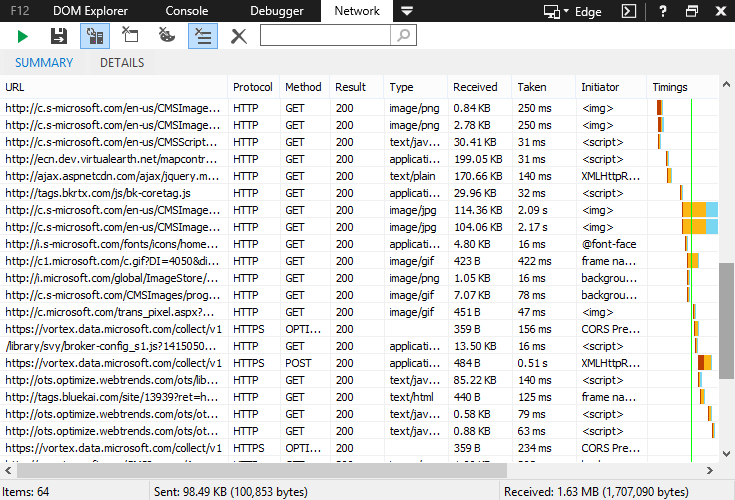 Identifying network requests that slow the loading of your webpages. Learn more about the Network tool. The UI responsiveness tool helps you dig into what is happening when your page slows down. Using it to profile specific points of slowness shows the operations that are causing them. Identifying the different sources of CPU activity causing UI slowness. Insight into your webpage's frame rate. Setting labels on the timeline to isolate user scenarios. Event type filtering helps you focus on the event types most important to you. Filter to event lets you drill down to just the event and the items within its inclusive time. Save and load your profiling sessions for later analysis. HTTP requests for images show an image preview in the details pane. The UI activity filter helps you focus on or filter out UI-related events. Filter out items taking less than 1 ms, uncluttering the profiling report. Learn more about the UI responsiveness tool. Tracking which functions were executed in web workers. Isolating the slowest parts of your code. Learn more about the Profiler tool. When a webpage starts out fast and slows down after you use it for a while, the culprit is usually a memory leak. The Memory tool tracks the memory use of your webpage, helping you identify where memory use is growing, why it's growing, and how to fix it. A timeline to see progressive changes in memory use. Snapshots to examine the details of memory use at specific points. Snapshot comparisons to identify specific points of growth. Identifying points of memory growth. Measuring the memory use of objects. Objects related to functions are linked to the Debugger tool. Clicking them will open the associated script in the Debugger tool and scroll the script pane to that function. The Scope menu is added to snapshot comparisons to provide different perspectives. Set, Map, and WeakMap containers from ECMAScript 6 are now supported. 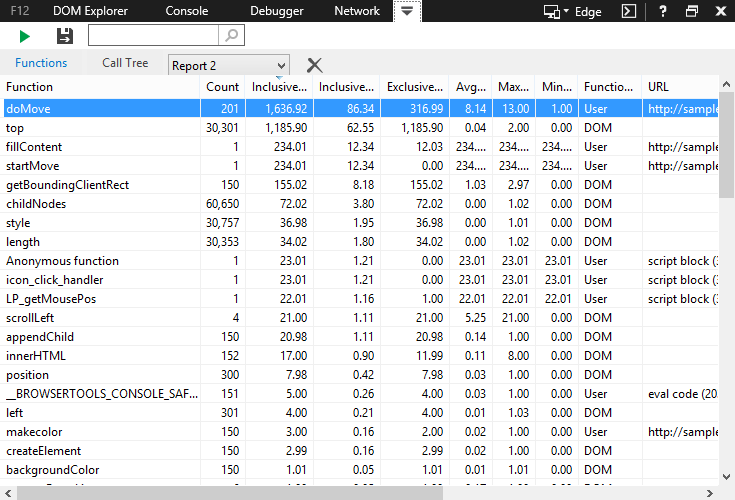 Save and load your memory profiling sessions for later analysis. Dominator folding collapses less pertinent items under parent items to help surface important memory issues better. Better recognition and handling of circular references so you don't traverse through endless loops. Learn more about the Memory tool. The Emulation tool helps you test how your webpages run on different screen sizes and hardware features, and how they respond to different user agent strings. You can emulate different screen sizes and resolutions. Testing responsive designs on multiple screen types. Testing location-aware features for a mobile site. 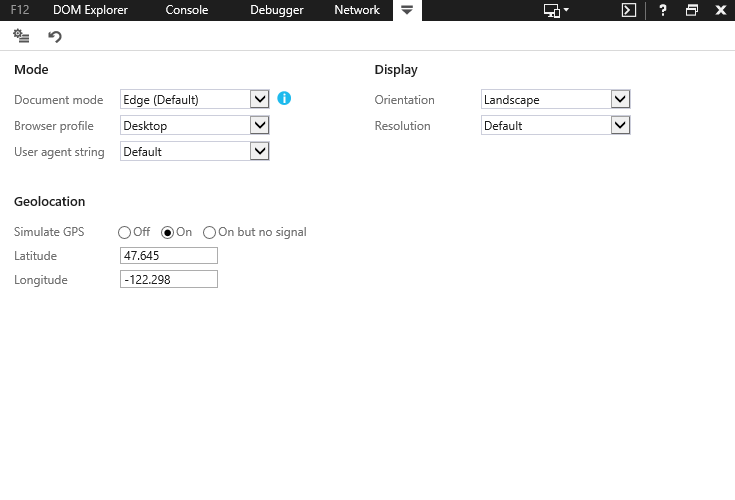 A toggle to make emulation settings persist between sites and even windows. Document mode reasons tell you why IE is emulating a different mode. A Document mode dropdown at the top of all the tools gives you quick access to our most popular emulation feature. Learn more about the Emulation tool.